Synopsis : Angered by the death of his best friend at the hands of Black Satan, Sigeru Jo (Stronger) convinces an ex-Black Satan scientist named Dr. Masaki to transform him into a cyborg. Given the super electromagnetic dynamo implant, Shigeru is reborn as Kamen Rider Stronger. However, this power comes with a price, the Denki energy that now powers his body, has turned his hands silver. So even while as Shigeru, he must wear hands to protect his dual identity. Aided by the first female cyborg, Yuriko Misaki became Tackle, and fought just as hard as Stronger did. She was killed in episode 30 by General Shadow. Toward the end of the series, a showdown began between Stronger, and the Great Boss. 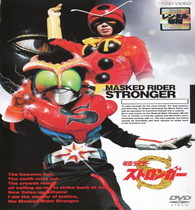 The final battle, Stronger was on the edge of defeat, but the other Kamen Riders came in to help stop the Great Boss (the Great Boss controls all the organizations in the Kamen Riders shows and films).